Newcomer Family Obituaries - Almeda Hale 1925 - 2019 - Newcomer Cremations, Funerals & Receptions. Hale, Almeda age 93, of Cincinnati, Ohio passed away on Saturday, February 2, 2019. 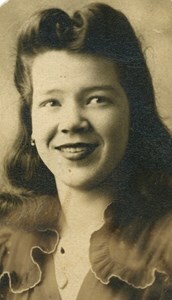 She was born in Olive Hill, Kentucky on May 11, 1925 to the late Reese Dee and Ruth Elizabeth Stephenson (nee Elliott ). She was preceded in death by her parents; her beloved husband, Walter Dunlap Hale; her brothers, Charles Ralph Stephenson and Earl Stephenson. Almeda is survived by her daughter, Stephanie Sue (Theodore) Hale; her sister, Betty Christine Mauck; her nieces, Vicky and Ellen; her nephews, Mike, Randy, Todd and Alan; and a host of other family members and friends. Visitation will be held on Friday, February 8, 2019 from 11:00 am until the time of service at 1:00pm at Newcomer Funeral Home - West Side Chapel, 3300 Parkcrest Lane, Cincinnati, Ohio 45211. Burial will be held in Highview Cemetery in Bloomsfield, Kentucky. To share a memory of Almeda or leave a special message for her family, please click the Share Memories button above. Add your memories to the guest book of Almeda Hale. Almeda was a dear friend to my family and I will always remember her sense of fun, enthusiasm for life and the great stories she told. RIP Mommy Hale. I regret to say, I never met this lady, but I have been friends with her amazing daughter for many years. If Stephanie's look-alike face signals a similar likeness between the two women in personality and character, then it is my loss never to have met Mrs. Hale. My prayers are with Stephanie and all their family, along with the sure and certain hope of resurrection for Steph's mother, and the knowledge that she has gone Home. Stephanie, Freda and I are so sorry to hear of your sweet Mothers passing. Always loved her visits at Dad and Moms. Much love and prayers during this difficult time. The family of Freddy and Phyllis Evans. Freda, Teresa, Nick and family ? ?